Transfer PDF and EPUB eBooks from Mac to iPad. Copy PDF and EPUB eBooks from iPad to Mac. Backup PDF and EPUB eBooks in iPad to iTunes. Newly support latest iPhone XS, iPhone XS Max, iPhone XR, iPad mini 4, iPad Pro, iOS 12 and iTunes 12. 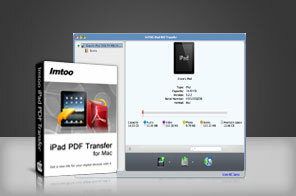 Facilitate for eBook readers on iPad, ImTOO iPad PDF Transfer for Mac is designed to help you transfer eBooks in PDF and EPUB formats to iPad/iPod touch/iPhone fast and straightforwardly. This PDF to iPad Transfer for Mac also enables you to transfer PDF and EPUB eBooks from iPad/iPod touch/iPhone to Mac, copy all eBooks in iPad/iPod touch/iPhone to iTunes. Besides, ImTOO iPad PDF Transfer for Mac also qualifies you to edit PDF and EPUB eBook information such as name, author and rate or comment on them. A large range of iPad/iPod touch/iPhone devices are supported, such as iPad, iPad 2, iPad 3, iPad 4, iPad mini, iPad mini 2, iPad mini 3, iPad mini 4, iPad Air, iPad Air 2, iPad Pro, iPod, nano (5th Gen), iPod mini, iPod shuffle, iPod classic, iPod touch, iPod touch 4, iPod touch 5, iPod touch 6, iPhone, iPhone 3G, iPhone 3GS, iPhone 4, CDMA iPhone 4, iPhone 5, iPhone 5S, iPhone 5C, iPhone 6, iPhone 6 Plus, iPhone 6S, iPhone 6S Plus. Batch tasks can be transferred simultaneously. Capable of transferring eBooks in PDF and EPUB format from iPad to Mac as backup straightforwardly without iTunes. Move eBooks in formats of PDF and EPUB on your Mac to iPad with fastest speed and high efficiency. Compatible with iTunes, you can also backup PDF and EPUB eBooks in your iPad to iTunes. iTunes 9.2 or above is supported. Compatible with most iPad/iPod touch/iPhone versions, including iPad, iPad 2, iPad 3, iPad 4, iPad mini, iPad mini 2, iPad mini 3, iPad mini 4, iPad Air, iPad Air 2, iPad Pro (12.9/9.7/10.5 inch), iPod, nano (5th Gen), iPod mini, iPod shuffle, iPod classic, iPod touch, iPod touch 4, iPod touch 5, iPod touch 6, iPhone, iPhone 3G/3GS, iPhone 4, iPhone 5/5S/5C/SE, iPhone 6/6 Plus, iPhone 6S/6S Plus, iPhone 7/7 Plus, iPhone 8/8 Plus, iPhone X, iPhone XS, iPhone XS Max, iPhone XR. Edit name and author of PDF and EPUB eBooks to personalize them. You can also rate or make comments on these eBooks. Search wanted eBooks with ease with file filter in the category of file name, size, type or author. Recognize connected devices and display detailed information of them, such as name, mode, capacity (occupied and left), version, serial number and etc. Impressive high-speed in transferring files between iPad/iPod touch/iPhone, Mac and iTunes brings the best performance. Batch transferring is also supported to enhance the performance of the application. Multi-lingual interface is available in language of English, French, Italian, Spanish, German, Japanese, Simplified or Traditional Chinese. Convert DVD to iPad videos/music on Mac to play DVD movies on your iPad.